Natural and artificial radioactivity appears to be different in different geological regions. Moreover, the radionuclides may migrate to the deeper region of the earth after deposition, and the depth profile of a radionuclide reveals information on the rate of migration. Countrywide background gamma radiation mapping program has been initiated in Bangladesh by dividing the whole country primarily into ~2 km × ~2 km (1' ×1' in Global Positioning System scale) systematic square grids to formulate the radioactivity profile. About 28 km × 30 km area of forest land of Gazipur district called the “BhawalGahr” including the Bhawal National Park was selected for sampling. Soil samples from 0 to 5 cm, 5 to 15, cm and 15 to 30 cm depth were collected from the 27 grid node points of the square grids. A total of 81 samples were collected for the current study. The samples were subjected to elemental and radioactivity analyses. The elements found in the samples were in decreasing order as Fe>K>Ti>Ca>Co>Mn>V>Cr>Ni. 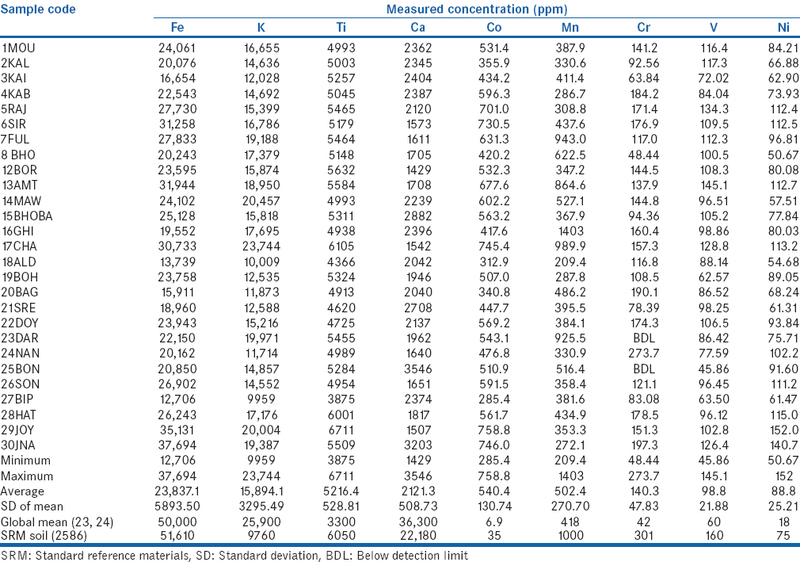 The calculated activity concentration of natural radionuclides 226Ra, 232Th, and 40K for surface soil samples (0–5 cm depth) ranged from 44.2 ± 5.7 to 84.5 ± 10.2 Bq/kg, 75.6 ± 8.3 to 126.5 ± 8.3 Bq/kg, and 263.7 ± 92.3 to 606.7 ± 107.9 Bq/kg, respectively and there is no significant variation for other depths. The radiological hazard indices such as radium equivalent activity, radiation external hazard index, absorbed dose rate, and annual effective dose were also estimated from the calculated values of activity concentrations. The earth is radioactive, due to the decay of natural long-lived radioisotopes. The radioactivity level from the natural radionuclides is termed as background radiation, and it depends on the amount of the radioactive materials in the environment. The background radiation may be high if the environment is polluted either from natural or human-made activities. Materials from the deposit may may be brought to the surface soil through weathering of rocks and soil formation. It can leach into the ground water system, contaminate it, and also can pollute far away from the source. Approximately 85% of human radiation exposure originates from natural sources such as cosmic radiation, exposure to radon gas, and terrestrial radionuclides. Natural radioactivity is widespread in the earth's environment: in soil, plants, water, air, coal, and phosphate deposits and its determination is very important to assess human exposure to ionizing radiation. Natural radionuclides in soil represent the significant component of background exposure. The natural radioactivity in soil originates mainly from the 238U and 232Th parent series and natural 40K. Soils are complex mixtures of solids from nanometer to millimeter in particle size, and may be containing moisture which plays a major role in the distribution of radionuclides. Spatial distribution of natural radionuclides (238U and 232Th series nuclides and 40K) in soil is governed by weathering, sedimentation, leaching/sorption, and precipitation from percolating groundwater or dilution with other materials with different composition, resulting in great variability in their activity concentrations. Radium is distributed more irregularly with depth than thorium. They can move through the water, air, and food supply. Activity concentrations of 40K increased with increasing of soil density, reflecting that most potassium is contained in mineral components of the soil. The objective of the current study is to estimate the countrywide background radioactivity (mainly - γ) originating from natural and probable artificial radioactive source by dividing the whole country into reasonable systematic square grids, to formulate a countrywide background radioactivity mapping database. The present study is devised to detect the probable radionuclides and estimate their activity concentration in the soil vertically and also horizontally. The results from this study would produce a baseline radiation map for the area which would be used as reference information to assess any change in the background radioactivity level due to the change in the topography of the location, settlement around it as well as any artificial influences on the environment. 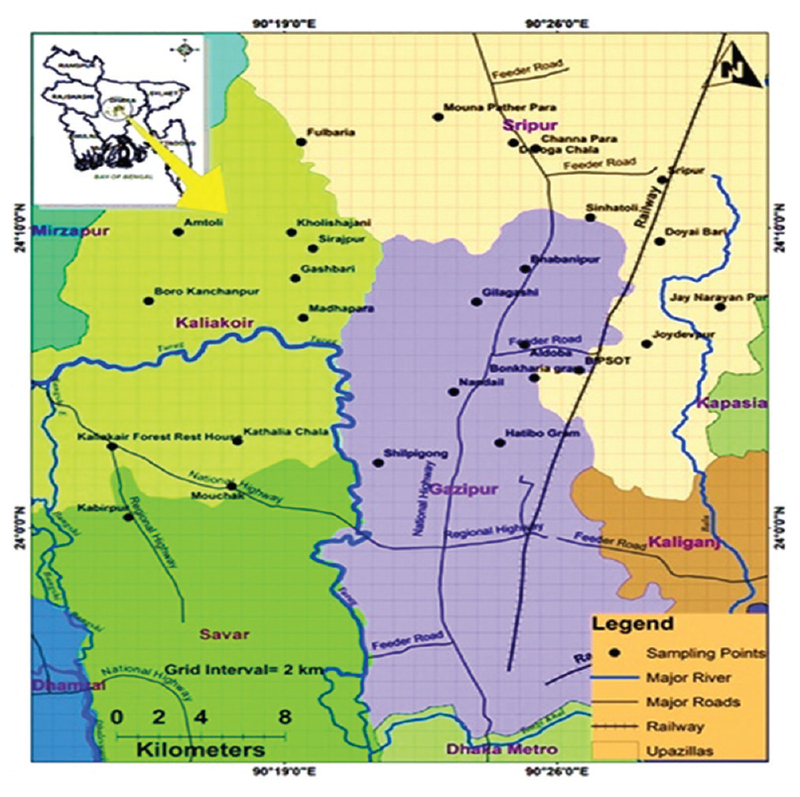 The present study was carried out from March 2011 to July 2012 in “BhawalGahr” area of Gazipur district of Bangladesh. The area is located adjacent to the only research reactor of Bangladesh. The studied area is situated in latitude 24°00' 21” N–24°13' 42” N and longitude 90°14' 35” E–90°30' 11” E, and at the altitude varying from 10 to 15 m above the mean sea level. Based on the data collected for the period 2001–2011, the climate in the area is moderate with an average annual temperature of 26°C and relative humidity of 72% and a mean annual precipitation of 2204 mm. The prevailing winds blow in South, Southeast, North, Northeast, Northwest, North-Northwest, and West directions. The average annual evaporation rate is about 40 mm. The vegetation in the forest sites is mostly pure “sal” trees. 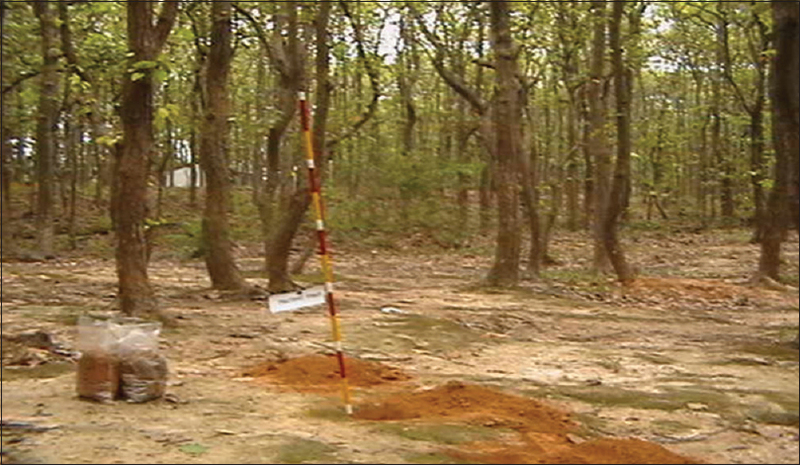 However, there are patches of lands inside the forest containing no trees but cultivable lands. Deeply concentrated clusters of “Gazari” trees as well as newly planted trees of different varieties are also seen in some places. In the investigated site, the soils contain metals such as Mg, Fe, Na, Cl, K, N, and O2 which are essential for plants. [Figure 1] shows the satellite map of the area under investigation. Standard sample collection protocols were followed in sampling to maintain a high quality of the sampling technique., Online satellite map was used to select the sampling points, and during collection of sample, the sampling points were again confirmed using the “Global Positioning System” (GPS). Systematic square grid was designed with a node-node distance of 1' and grid area of 1' ×1' in GPS scale (~2 km × 2 km area in normal scale). The samples were collected from the grid node points of the square grid. In some cases, samples could not be collected from the exact node points because of obstacles such as buildings, marshy lands, and lack of accessibility. During sampling, related and required data such as environmental condition, color of soil, weather, date, and time were noted. To collect the sample, a 1 m × 1 m undisturbed sampling sites were selected to ensure that the samples were not influenced by human-made or anthropogenic activities. Three diagonally equidistance positions were selected for sampling within this area and samples were mixed together to get representative samples. After manually eliminating grasses, pebbles, and other unnecessary materials from the selected area, three soil samples were collected from 0 to 5 cm depth from each position. The three samples were then mixed properly to make the representative sample of that location. Samples for 5–15 cm and 15–30 cm depth were collected in a similar manner. About 1 kg soil was collected from each sampling point. The sample was then kept in a clear plastic packet and marked properly for identification. The samples were then taken to the laboratory for analysis. Twenty-seven samples were collected from each depth. Therefore, a total of 81 samples were collected from three different depths for the current study. [Figure 2] and [Figure 3] show the sampling locations and typical sample collection procedure in the study. After crushing the soil sample manually, they were then dried in the sun for several days. Dried samples were cleared by removing stones, pebbles, grass roots, straws, etc. To make the soil samples moisture free, it was dried in a temperature controlled oven at 100°C for 24 h. The dried samples were ground to fine powder and homogenized using stone mortar paste and passed through a sieve of 200 μm mesh size to get appropriate particle size for measurement. Each dried sample was placed in cylindrical plastic containers of 6 cm diameter and 7 cm height with a volume of 180 ml. The weights of the empty and sample-filled containers were taken by an electronic balance. The net weights of the samples, dates, and sample IDs were recorded in the register. The same information was also written on the top of the containers. Then, the container was closed by screw caps tightly and wrapped with thick vinyl tape about their necks. The samples were then kept for 4 weeks to assure the secular equilibrium between 238U and 232Th series and their progenies. [Figure 4]a shows the sample processing steps whereas [Figure 4]b displays some prepared samples. The detection and measurement of radionuclides in the samples were carried out by gamma spectrometry system using a vertical coaxial cylindrical high purity germanium (HPGe) detector of 172 cm3 active volume and 20% relative efficiency. The p-type HPGe detector was supplied by CANBERRA (Model GC4020). The detector was coupled to a 16 k-channel computer analyzer. The analysis was carried out using Genie 2000 software, which matched various gamma energy peaks to a library of possible radionuclides. The detector was enclosed in a cylindrical shielding container made of lead and iron with 11.3 cm thickness, 51 cm height, and 28 cm internal diameter and with a fixed bottom and moving cover to reduce the external gamma-ray background. All the samples were counted for 10 ks. Before the measurement of the samples, the gamma background at laboratory site was determined with an identical empty plastic container used in the sample measurement. 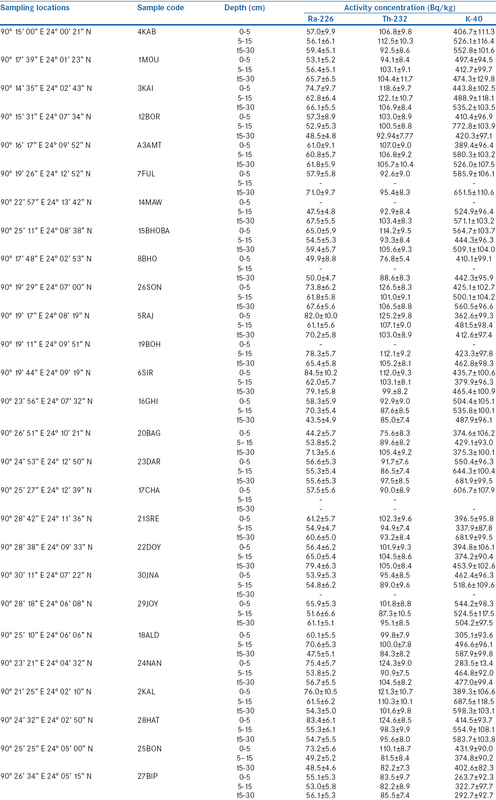 The average of the activities from the peaks of 295 and 352 keV of 214Pb and 609, 1120, and 1764 keV of 214Bi were used for the determination of 226Ra, 583 and 2614 keV of 208Tl, and 911 and 969 keV of 228Ac were used for 232Th. The measurement uncertainties are presented at the 95% confidence level. The efficiency calibration of the detector was performed by homogeneously incorporating of standard solutions of 226Ra into inactive matrices (e.g., Al2O3) with almost the same composition and density as the sample to be assayed. The standard was prepared by pipetting a volume of the solution onto the matrices and subsequent drying over 24 h at 408°C. To ensure that the radionuclides were homogeneously distributed in the source, the sample was carefully mixed before measurement., The energy calibration of the detector was performed by 137Cs and 60Co point sources. 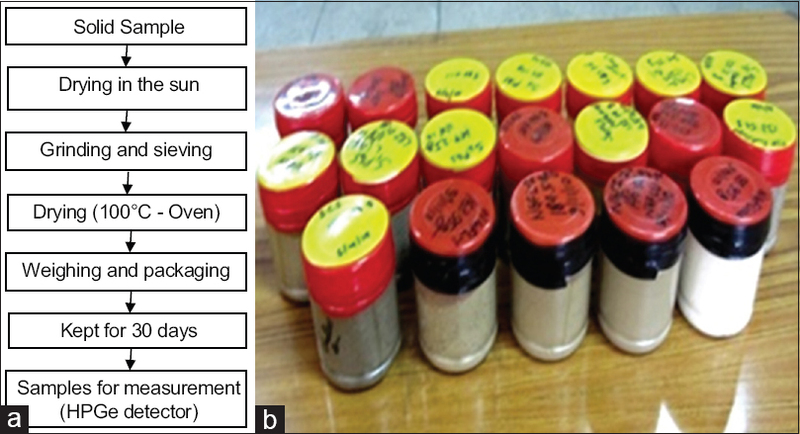 The elemental analysis of the collected soil samples for major and trace element contents was carried out by proton-induced X-ray emission technique with a 3 MV tandem accelerator at the Institute of Nuclear Science and Technology, Atomic Energy Research Establishment, and Bangladesh Atomic Energy Commission, Savar, Dhaka. Samples were prepared for irradiation following conventional methodology and irradiated with proton beam of energy of 2.5 MeV. The X-rays emitted during irradiation from the samples were measured by HPGe detector, and the acquired spectrum was analyzed using the GUPIX code. The program calculates the area under each peak by lest square fitting then converts it to concentration using well-accepted formula. At first, the program calculates the major elements or so-called matrix elements, whose concentrations are large, then the program calculates the trace elements or so-called minor elements, whose concentrations are very small. The physics of characteristic X-ray emission from samples is well understood and should be able to give accurate quantification but practically due to uncertainty in measuring number of particle hitting the sample and solid angle, etc., similar standard was used for calibration of the setup (SRM 2586). First, the system was run for the soil standard, and concentration values were calculated then comparison was made with the obtained values with those of certified values that gives the calibration factors, which are then stored inside the GUPIX library for further unknown soil analysis. Where A = Activity concentrations of the sample in Bq/kg, cps = The net counts per se cond = cps for the sample – cps for the background value, E = The counting efficiency of the gamma energy, I = Absolute intensity of the gamma ray, and W = Net weight of the sample (kg). Where, Ns is the counts measured in time Ts and Nb is the background counts measured in time Tb. The standard deviation σ in cps was converted into activity in Bq/kg according to Equation 1. The measurement uncertainties are presented at the ± 2σ or 95% confidence level. Where CRa, CTh, and Ck are activity concentrations of 226Ra,232Th, and 40K in Bq/kg, respectively. The value of Hex must be lower than unity to keep the radiation hazard insignificant. Interelement relationships in soil matrix provide information on heavy metal sources and pathways in the geo-environment. Correlation means correlation or whether and how strongly the pair variables are related. The correlation coefficient is a number that summarizes the direction and degree (closeness) of linear relations between two variables. The correlation coefficient (r) is also known as the Pearson product-moment correlation coefficient in honor of its developer Karl Pearson. The correlation coefficient can take values between -1, 0, and +1. The sign (+ or −) of the correlation affects its interpretation. A perfect correlation of ±1 occurs only when the data points all lie exactly on a straight line. If r = +1, the slope of this line is positive. If r = −1, the slope of this line is negative. A correlation >0.8 is generally described as strong, whereas a correlation <0.5 is generally described as weak. The coefficient of determination r2is useful because it gives the proportion of the variance (fluctuation) of one variable that is predictable from the other variables. The coefficient of determination is the ratio of the explained variation to the total variation. The coefficient of determination is such that 0< r2<1 and denotes the strength of the linear association between variables. In this study, Pearson correlation was conducted on heavy metal concentration at each site to assess possible co-contamination from similar sources at data set. The elements' concentration levels found in soil samples are in decreasing order as Fe>K>Ti>Ca>Co>Mn>Cr>V>Ni. The results obtained were compared with that of the worldwide average values as shown in [Table 1] as well as the values of the “Standard Reference Materials”/(standard soil) have also been incorporated. From the comparison, it is observed that the average concentration of the elements Ti, Co, Mn, Cr, V, and Ni are clearly higher than those of the worldwide average values., The soils of Bangladesh have been formed from different kinds of parent materials. Physiographically, these are classified into three major units, namely (i) Northern and Eastern Hills of Tertiary formation occupying 12% of the total area, (ii) Pleistocene Terraces of the Madhupur and Barind Tracts occupying 8% of the total area, and (iii) recent floodplains covering the rest 80% of the total area. The current area under study - “BhawalGahr”- falls under the Madhupur Tract of the above classification, and soils are mainly composed of mica and feldspar. On the other hand, the average concentrations of Fe, Ca, and K were found to be lower than those of the worldwide average values,, which indicate that the sources of these elements more probably originated from their natural sources or background concentrations in the area under investigation. Although the soil contains mainly mica and feldspar, there may be some heavy mineral containing Ti which is responsible for increased Ti value. Again, Fe concentration may be increased due to weathering (oxidation) of the soil. The collected samples were analyzed to observe the horizontal as well as vertical distribution of the radioactivity concentration in the area under investigation. 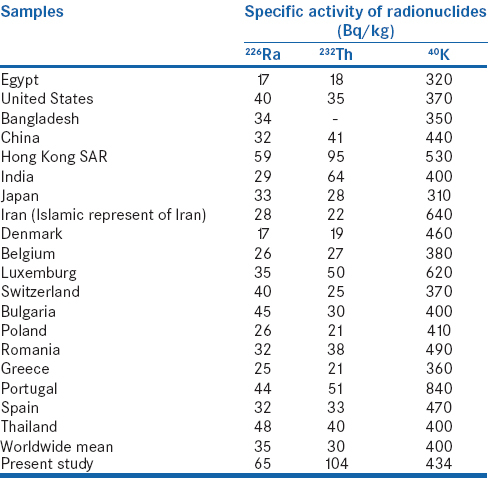 The vertical distribution of the detected radionuclides and their corresponding activity of the samples collected from three different depths (0–5, 5–15, and 15–30 cm) have been summarized in [Table 2], whereas the spatial/lateral distribution of these radionuclides has been illustrated in [Figure 5],[Figure 6],[Figure 7] using contour/topographic maps. From the analysis, it is observed that only naturally occurring radionuclides such as 214Pb,214Bi,226Ra,228Ac,208Tl (due to 238U and 232Th decay), and 40K were present in the samples, no artificial radionuclides such as 137Cs and 134Cs were found in any of the samples. The calculated activity concentration of 226Ra,232Th, and 40K for surface soil samples (0–5 cm depth) were ranged from 44.2 ± 5.7 to 84.5 ± 10.2 Bq/kg, 75.6 ± 8.3 to 126.5 ± 8.3 Bq/kg, and 263.7 ± 92.3 to 606.7 ± 107.9 Bq/kg, respectively, with an average of 63.5 ± 6.8 Bq/kg, 104.5 ± 8.9 Bq/kg, and 433.9 ± 96.4 Bq/kg, respectively. For samples with depth of 5–15 cm, these values were varied from 47.5 ± 4.8 to 78.3 ± 5.7 Bq/kg, 81.5 ± 8.4 to 122.1 ± 10.7 Bq/kg, and 322.7 ± 97.7, 772.8 ± 103.9 Bq/kg, with an average of 58.5 ± 5.6 Bq/kg, 98.2 ± 8.9 Bq/kg, and 491.7 ± 101.3 Bq/kg, respectively, and those for 15–30 cm depth, varied from 43.5 ± 4.9 to 79.4 ± 6.3 Bq/kg, 82.2 ± 7.3 to 106.9 ± 8.4 Bq/kg, and 292.7 ± 92.7 to 681.9 ± 99.5 Bq/kg, with an average of 60.8 ± 5.6 Bq/kg, 97.8 ± 8.6 Bq/kg, and 508.5 ± 100.9 Bq/kg, respectively. The average activity concentrations of 226Ra,232Th, and 40K for all the samples were found to be higher than those of the worldwide average values of 35, 30, and 400 Bq/kg, respectively. The higher values of concentrations may be attributed to the geological characteristics of this area. The maximum values of activity concentrations of 226Ra,232Th, and 40K were detected for 0–5 cm depth in samples with code 21SRE, 26SON, and 17CHA, respectively, whereas the minimum values for the same were found in sample with code 20BAG and that of 40K was found in sample 27BIP. Accordingly, the maximum values of activity concentration of 226Ra,232Th, and 40K were detected for 5–15 cm depth in samples with code 19BOH, 3KAI, and 12BOR, respectively. The minimum values of activity concentrations were observed in 14MAW, 25BON, and 27BIP, respectively. Similarly, the maximum values of activity concentrations of said radionuclides were detected for 15–30 cm depth in 22 DOY, 3 KAI, and 23DAR, respectively. The minimum values detected in 16GHI, 25BON, and 27BIP, respectively. [Figure 5] shows the spatial distribution of 226Ra,232Th, and 40K in the samples in contour maps collected from at 0 to 5 cm depth from the whole area (28 km × 30 km), whereas [Figure 6] and [Figure 7] show the distribution of the radionuclides at 5–15 and 15–30 cm depths, respectively. It is observed from the map that the contour lines enclose smaller and smaller areas and finally converged to a single point showing “hot spots” of activity concentration for a particular radionuclide and outward contour lines indicate the decreasing gradient of the activity concentration of the radionuclide. A comparison of activity concentration values with those of other countries is given in [Table 3]. [Table 4] presents the calculated values of radionuclide hazard indices. From the table, it is observed that the values of Raeq were ranged from 181.0 to 292.1 Bq/kg, 195.0 to 274.9 Bq/kg, and 196.9 to 264.3 Bq/kg, with an average of 246.0, 236.7, and 239.7 Bq/kg for the depth of 0–5, 5–15, and 15–30 cm depth, respectively. The estimated average Raeq values of the present work are lower than the recommended value of 370 Bq/kg. The values of Hex for the same depth were varied from 0.49 to 0.79, 0.53 to 0.74, and 0.53 to 0.71, with an average of 0.67, 0.64, and 0.65, respectively. The average values of Hex are clearly below than that of the recommended value. As the formulae for the estimation of D is valid for uniform distribution of radioactivity in the soil and at 1 m above the ground, therefore, the values of D as well as Eff for soil samples of depth 0–5 cm are given in [Table 4]. The values of D and Eff for soil samples of depth 0–5 cm were found to be varied from 81.82 to 131.20 nGy/h and 0.10 to 0.16 mSv/year, respectively. The values of D and Eff are observed to be almost double than the worldwide average values of 55 nGy/h and 0.04 mSv/year, respectively. In the current study, an attempt has been made to find out a correlation between elemental content (Fe, K, Ti, Ca, Co, Mn, V, Cr, and Ni) and natural radioactivity concentration (226Ra,232Th, and 40K) in soil samples collected from the area under investigation. In this regard, correlation analysis has been performed through statistical analysis, the result of which is given in [Table 5]. From [Table 5], it is observed that there is no significant correlation between the elements and radionuclides. The significant correlation between 226Ra and 232Th strongly suggests the coexistence of these radionuclides in natural environmental sources. Spatial and vertical distribution of probable radionuclides and their activity concentrations were investigated in the soil samples collected from the “BhawalGahr” area of Gazipur as a part of countrywide background radiation mapping program in Bangladesh. A total of 81 soil samples were collected from an area of 28 km × 30 km and three different depths of 0–5, 5–15, and 15–30 cm with 27 samples collected from each depth. The radionuclides detected in the soil samples were all natural, and no artificial radionuclide was found in any of the samples. The activity concentrations of 226Ra and 232Th are almost double of the worldwide mean values, whereas the concentration for 40K is comparable with the worldwide value. The vertical distribution of 232Th and 40K showed a decreasing tendency of activity concentration with depth, whereas there was no particular tendency with depth was observed for 226Ra in the study. Raeq and external hazard indices are well below the defined hazard limit of 370 Bq/kg and 1, respectively. The Pearson's linear correlation coefficient between the elemental content and radioactivity concentrations of 226Ra,232Th, and 40K has been calculated to understand the correlation between elemental content and radioactivity. The results of the current study can be used as baseline data for the future use. Chandrasekaran A, Ravisankar R, Senthilkumar G, Thillaivelavan K, Dhinakaran B, Vijayagopal P, et al. Spatial distribution and lifetime cancer risk due to gamma radioactivity in Yelagiri Hills, Tamil Nadu, India. Egypt J Basic Appl Sci 2014;1:38-48. Solecki J, Chibowski S. Studies on horizontal and vertical migration of 90Sr in Soil systems. Pol J Environ Stud 2002;11:157-63. Abbady A, Ahmed NK, El-Arabi AM, Michel R, El-Kamel AH, Abbady AG. Estimation of radiation hazard indices from natural radioactivity of some rocks. Nucl Sci Tech 2006;17:118-22. El-Arabi AM, Ahmed NK, El-Kamel AH. Gamma Spectroscopic Analysis of Powdered Granite Samples in Some Eastern Desert's Areas Proceedings of the Fifth Radiation Conference, 5-9 November, 2000, Cairo, Egypt; 2000. Ravisankar R, Chandrasekaran A, Vijayagopal P, Venkatraman B, Senthilkumar G, Eswaran P. Natural radioactivity in soil samples of Yelagiri Hills, Tamil Nadu, India and the associated radiation hazards. Radiat Phys Chem 2012;81:1789-95. Available from: http://www.bmd.gov.bd/?/home/ and http://www.bwdb.gov.bd/, [Last accessed on 2017 Feb 05]. Contaminated Land Management Guidelines No. 5, Guideline on Site Investigation and Analysis of Soil, Ministry for the Environment, New Zealand. Available from: http://www.mfe.govt.nz/publications/land-hazards/ contaminated-land-management-guidelines-no-5-site-investigation-and analysis of soils. [Last accessed on 2017 Mar 13]. IAEA. Soil Sampling for Environmental Contaminants, IAEA-TECDOC-1415. Vienna, Austria: Industrial Applications and Chemistry Section, International Atomic Energy Agency, Wagramer Strasse; 2004. Abusini M, Al-Ayasreh K, Al-Jundi J. Determination of uranium, thorium and potassium activity concentrations in soil cores in Araba valley, Jordan. Radiat Prot Dosimetry 2008;128:213-6. Roessier CE, Smith ZA, Bolch WE, Prince RJ. Uranium and radium in fluoride phosphate materials. Health Phys 1970;37:269-77. Samad A, Haydar A, Ali I, Paul D, Bhuiyan MR, Islam SM. A study on the radioactivity level in raw materials, final products and wastes of the phosphate fertilizer industries in Bangladesh. J Environ Prot 2012;3:1393-402. Available from: http://www.scirp.org/journal/Articles.aspx?searchCode=A+study+on+the+radioactivity+level+in+raw+materials%2c+final+products+and+wastes+of+the+phosphate+fertilizer+industries+in+Bangladesh&searchField. [Last accessed on 2017 Mar 02]. HarbS, Din KS, Abbady A. Study of Efficiency Calibrations of HPGe Detectors for Radioactivity Measurement of Environmental Samples. Proceedings of the 3rd Environmental Physics Conference, Aswan; 19-23 February, 2008. Sharriff A, Borua B, Uddin S, di Hasan MM, Ullah AK, Huq A, et al. Heavy Elemental Contamination of Soil in Ship Breaking Area. DUET, Gazipur-Bangladesh: Proceedings of International Conference on Industrial Waste Management and Process Efficiency, Department of Civil Engineering; 2012. p. 541-5. Uosif MA, El-Taher A. Radiological assessment of Abu-Tartur phosphate, Western Desert Egypt. Radiat Prot Dosimetry 2008;130:228-35. Knoll GF. Radiation Detection and Measurement. 3rd ed. New Jersey, USA: John Willey and Sons; 1998. Lu X, Xiolan Z. Measurement of natural radioactivity in sand samples collected from the Booje Weithe sand park. China Environ Geol 2006;50:977-88. UNSCEAR. Sources and Effects of Ionizing Radiation. United Nations Scientific Committee on the Effects of Atomic Radiation, United Nations, New York; 2000. Debertin K, Helmer RG. Gamma and X-ray Spectrometry Detectors. North Holland: North Holland, Amsterdam, Netherlands;1988. Majumder RK, Faisal BM, Zaman MN, Uddin MJ, Sultana N. Assessment of heavy metals pollution in bottom sediment of the Buriganga River, Dhaka, Bangladesh by Multivariate Statistical Analysis. Int Res J Environ Sci 2015;4:80-4. Imamul Huq SM, Shoib JU. Environmental sciences, World soils book series. The Soils of Bangladesh. Springer Netherlands, Netherlands: Springer; 2013. Elements, Terrestrial Abundance. Archived from the Original on 10 April, 2007. Available from: http://www.daviddarling.info. [Last retrieved 2007 Apr 14]. UNSCEAR, Sources and Effects of Ionizing Radiation, United Nations Scientific Committee on the Effects of Atomic Radiation. Exposures from Natural Radiation Sources, Annex B, United Nations, New York; 2000. Kabata-Pendias A, Mukherjee AB. Trace Elements from Soil to Human. Heidelberg, Germany: Springer; 2007. p. 24-5. UNSCEAR, United Nations Scientific Committee on the Effects of Atomic Radiation, Report of UNSCEAR to the General Assembly, United Nations, New York, USA; 2000. p. 111-25.